HEC Scholarships 2019 for Bachelors, Masters & PhD Studies in Kingdom of Saudi Arabia Apply Online. 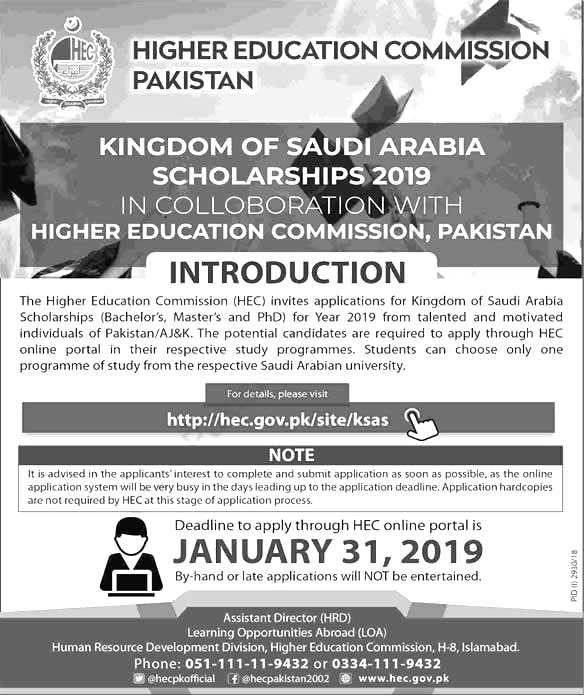 Latest HEC Scholarships 2019 for Bachelors, Masters & PhD Studies in Kingdom of Saudi Arabia Apply Online. Age must be between 17 years to 25 years for Bachelor's programme & Arabic language teaching institute, must be less than 30 years for masters and less than 35 years for PhD applicant as on closing date of application process. By closing date of application, must hold a minimum of 12 years higher secondary school certificate for Undergraduate programme, 16 years of education in relevant fields of study for Master's programme and postgraduate qualification (MS/MPhil degree) in the relevant field of study for admission in PhD programmes in respective Saudia Arabian University. Applicants must fulfil other requirements set by concerned university/Saudi's Govt. B.A. / B.Sc. / M.Sc. / M.A. / BBA / MBA / MS / M.Phil.